The Outstanding Service Awards for Tertiary Students (“Award”) were introduced in 1991 to recognize tertiary students with outstanding leadership and significant contribution to the community. 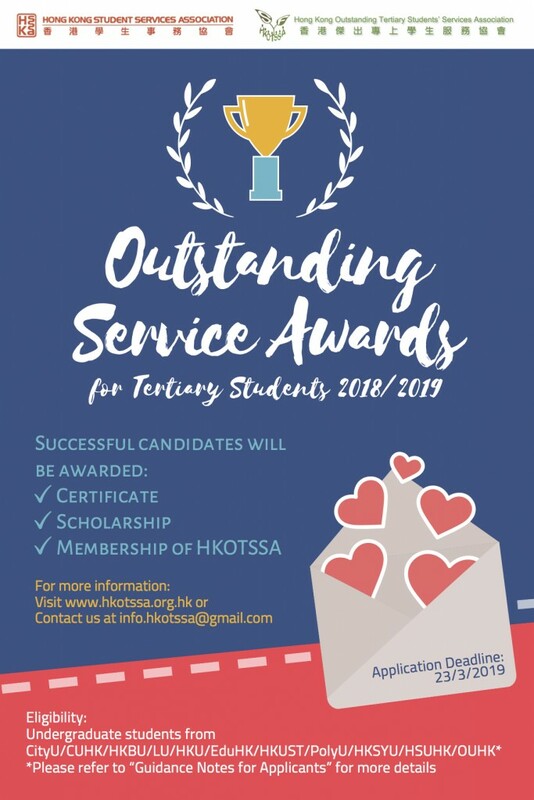 The award selection is co-organized by the Hong Kong Student Services Association (“HKSSA”) and the Hong Kong Outstanding Tertiary Students’ Services Association (“HKOTSSA”). Around 20 students are selected each year. The University of Hong Kong (“HKU”). All students from Hong Kong Shue Yan University (“HKSYU”), The Hang Seng University of Hong Kong (“HSUHK”) and Open University of Hong Kong (“OUHK”) are also eligible for the Award. Satisfactory results in public examinations and current academic studies. Around 20 students are selected each year. Application for 2018/2019 Award is now opened. Please send your completed application form and any other documentary proof to HKOTSSA’s email at info.hkotssa@gmail.com by 23 March 2019 (Saturday).